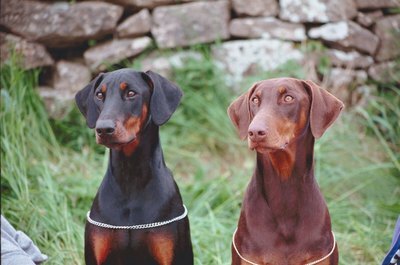 Dobermans are attentive and intelligent dogs, well-suited to tracking activities. Louis Dobermann developed the Doberman pinscher for personal protection. Today’s versatile Doberman can also be a family pet, a military or police dog, a performance dog or a search-and-rescue dog. Footstep tracking, one method of following a scent, can be fun for both the dog and the owner. Select your equipment. You will need a collar of any type and a 6-foot leash, either woven or leather, for early training. Once your dog has begun to follow a track you will need a harness and a 30-foot leash. Small puppies should be started on a lighter weight leash than you would use for an adult Doberman. Find a location of at least an acre or more to start. You will need a much larger area if you will be working up to the 440-yard tracks required for AKC competition. Your practice area should be flat ground free of running water, fences and paved areas. Put the collar and 6-foot leash on your dog. Plant one of your flags in the ground. Secure your dog where he can watch you scuffle your feet through the grass in an area about 2 square feet around the flag. Scatter a handful of treats into the scent pad that you have laid. Immediately after laying the scent, bring your dog to the scent pad. Have him sniff at the ground until he finds and eats all of the treats. As he sniffs, tell him to “seek,” to “find it” or to “such” (sook). Lay at least two scent pads the first day and allow him to sniff at the fresh scent. Practice several days using scent pads, allowing the track to age (go unused) for 5 additional minutes each day until your dog is finding a scent aged for 15 minutes. Add a second flag about 25 feet away from your first one. Walk between the two flags several times. On the last pass, drop treats into each of your footsteps. Place your glove or wallet at the base of the second flag and place a number of treats on it. Allow your dog to follow the track, using your chosen command. Encourage him to lie down when he “finds” the glove. Give him treats from the surface of the glove or wallet while he is in the down position. Age the track as you did the scent pad. Increase the track length in 25-foot intervals as your dog becomes confident with shorter track lengths. When you have three flags in a straight line, turn either left or right at a 90-degree angle. You should eventually have three approximately 150-yard "legs," marked only at the beginning, turns and end with flags. Change your dog to the harness and long leash as the track length increases; he should start working further in front of you. Eventually, he should be at the end of the 30-foot leash. Increase the aging time . If you will compete in tracking events, try to work your dog up to tracks aged no less than 30 minutes and for no more than 2 hours, as they would be at AKC tracking events. Remove the food from the track. Begin placing food in only every second or third step. When one or more turns, remove all but a few pieces of food and place “jackpots” of multiple treats at each turn. Remove all food treats from the track and turns when your dog follows a competition-length track with confidence. Have someone else lay the track. Your dog is now adept at following your footsteps, but now must learn to follow someone else's scent. Lay your track, marking the corners with flags. Walk the track a second time, removing all flags except the first one. Once your dog completes this course with confidence, your dog can follow scents! The tracking harness must not restrict the dog’s movement in any way and the D-ring to which the leash is attached must be on the dog’s back. Your training area should be on a grassy or a dirt surface. Asphalt, gravel and other inorganic surfaces will be too difficult for your dog to learn on. Your Doberman has close lips and lacks the long ears and lips that many tracking breeds have. Because he isn’t equipped to “trap” the scent, he may sniff around a lot, especially as he is learning. He will show you he is confident when his ears are forward and he consistently moves forward, no matter how much he sniffs. Always place a significant jackpot on the glove or wallet and have your dog lie down to receive them. When your dog lies down to indicate the glove or wallet, he is doing part of what he needs to do to pass a tracking test. Don’t wait to complete one step before moving on to the next. If your dog seems ready to progress in one way but not in another, alter your training plans to reflect that. All dogs progress different ways, none more correct than the other.